Flavor Text: "There is no country here..."
I love the "Path of Blood" spell and recently saw the synergy between it and "Old Sea Dog". Returning any minion to it's owner's hand for 1 mana and an exhaust seems pretty powerful to me. Is this "combo" worth putting into your deck? *I am a new CoC player, so I would love someone's input on this! I'm probably the most amateur player on this site, but in my opinion, your combo would only be worth it if you could recur Path of Blood (Yog-Sothoth, Chant of Thoth, The Large Man, etc.). If you can't recycle Path of Blood, then you're basically using 6 card slots in your deck for an effect that will likely occur only once or twice. Also, once your opponent sees what you're doing, the Old Sea Dog is going to attract a lot of your opponent's removal effects. 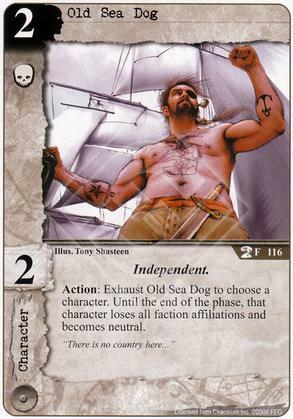 Figure on needing more cards (like Ys, which is a good card in its own right) that can protect your Old Sea Dog. The game is replete with ways of dealing with a 2-cost, 2-skill character who lacks any protection on his own. Try your combo out and see if you find the juice is worth the squeeze. Hunting Nightgaunt would probably fit great in such a deck, although that would commit you to including some Night cards. I'd also recommend you check out the Silver Twilight faction. Lord Jeffrey Farrington is arguably the best "bouncing" card in the game, and I find it's easier to get repetitive uses out of characters than out of events. Happy play-testing! I like this with Crescent Blade. It's like a budget Khopesh that does not wound your own characters.